Episode 108 welcomes Jared Nordin to the podcast for a chat with Skyler. Topics include: the Pacific northwest, career electrician, second marriage and dating, his political journey, Jack Spirko, Stefan Molyneux, Austrian economics, Lysander Spooner, challenging jurisdiction, Larken Rose, cognitive dissonance, outgroup bigotry, and more. 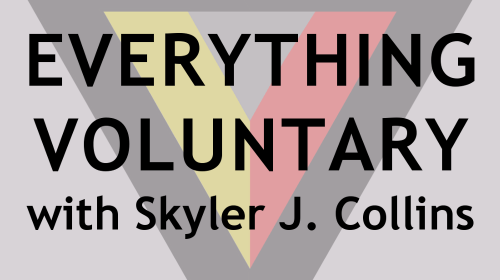 Episode 107 welcomes Alex Voss to the podcast for a chat with Skyler. Topics include: living in Chicago and Cincinnati, Serbia and the international opinion of the Clintons, economic traditions (Chicago, Austrian), philosophical journeys, good and bad laws, his libertarian influences, his career in legal risk mitigation in the healthcare industry, the importance of economic knowledge, getting married and starting a family, and more. Episode 105 welcomes Dennis Pratt to the podcast for a chat with Skyler. Topics include: writing for the open and curious with respect and empathy at Quora.com, his personal growth nonprofit organization, growing up as a New York liberal with a socialist perspective, debating with a staunch conservative colleague focused on logical consistency moved both of them toward libertarianism, recognizing the use of indirect violence, cognitive dissonance, why the Socratic method of disputation enrages people, raising a daughter who went in and out government schooling and his battles with teachers and school administrators, and more.